Distribution of the ocPortal application. Is there a better alternative to BitNami ocPortal Stack? Is BitNami ocPortal Stack really the best app in HTML category? Will BitNami ocPortal Stack work good on macOS 10.13.4? 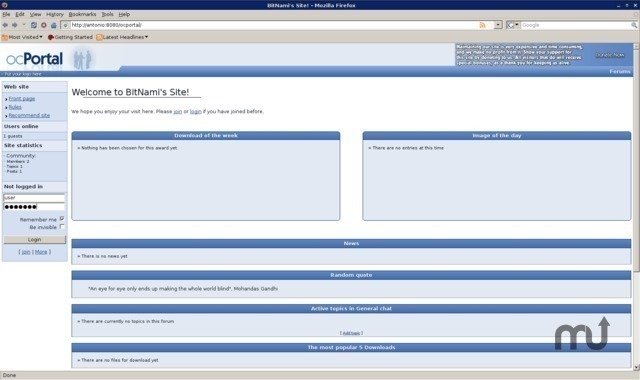 BitNami ocPortal Stack Native Installer is an easy-to-install distribution of the ocPortal application. It includes pre-configured, ready-to-run versions of Apache, MySQL, PHP and phpMyAdmin so users can get a ocPortal installation up and running in minutes after answering a few questions. Windows, Linux, Mac OS X and Unix operating systems are supported. BitNami ocPortal Stack needs a review. Be the first to review this app and get the discussion started! BitNami ocPortal Stack needs a rating. Be the first to rate this app and get the discussion started! ocPortal is a CMS with many Web 2.0 features for sophisticated sites. ocPortal supports many types of content (galleries, news/newsletters, etc.) - and integrating rich media and advertising into them. Community features include forums, member blogs, chat rooms, WIKI, and content commenting/rating. ocPortal lets you decide exactly how your site will look and behave. Features are plentiful, well integrated, and optional. Out-of-the-box your site will meet the highest accessibility and professional standards.